Here is a list of Best Free GIF Frame Editor Software For Windows. 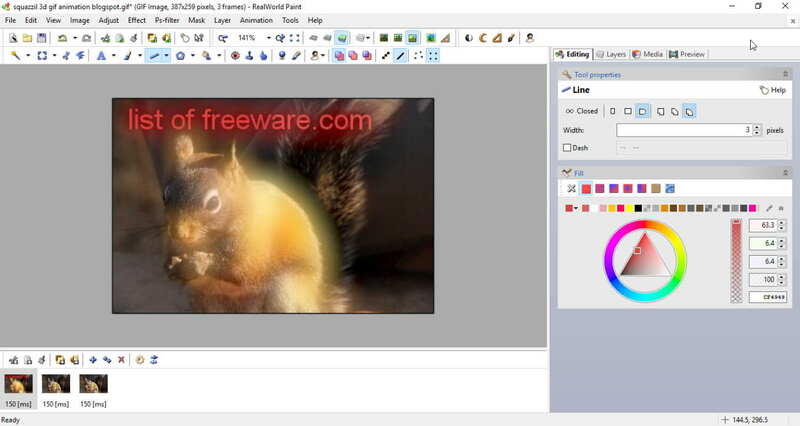 As the title suggests, these freeware let you edit an individual frame of a particular GIF. All of these GIF frame editor software contain a feature-rich set of GIF frame manipulating tools. These tools are standard as well as advanced editing tools, such as transformation (rotate, flip, resize, etc. ), paint (brush, pen, paint bucket, eraser, etc. ), layer (import files as layers, merge layers, customize blending mode, etc. ), and more. You can also add effects like Emboss, Pixelate, Oilify, Diffuse Glow, etc., add noise, blur GIF frames, change color levels, add watermark, insert text arts, and more. In all of these GIF frame editor software, you can change speed of GIF. In addition to that, you can delete frames, change the order of frames, add duplicate frames, insert new frames, etc. In one of these software, you can even create an image with all frames of a GIF. All of these provide real-time preview of GIF to make accurate changes. Good part is that these software can be used to create an animated GIF too. All in all, these software to edit GIF frames provide great editing tools and are easy to use. As these are primarily image processors, you can edit images, convert image formats, and do more. These software support popular image formats, such as JPEG, PNG, BMP, TIFF, ICO, etc. Although all of these software are great at modifying individual GIF frames, Chasys Draw IES is my favorite GIF frame editor. It provides powerful editing tools like advanced painting tools, layer tools, effect tools, etc. lets you change frame rate of individual GIF frames, and do more. Plus, it has an intuitive user interface and is extremely easy to use. As GIMP is quite a famous editing software, it is another good and convenient option to edit GIF frames. You may also like some best free GIF Animator Software, Video to GIF Converter Software, and GIF Compressor Software for Windows. Chasys Draw IES is a feature-rich image processor software for Windows. Using its Chasys Draw IES Artist tool, you can edit GIF frames separately. To do so, you need to open the desired GIF file. You will be then able to view its individual frames. Just right-click on a frame which you want to edit and click on Edit in New Window option. In this new window, you can edit GIF frames as per your requirement. It provides a wide range of image editing features which you can utilize as per need. A Toolbox consisting of various editing and drawing tools can be used to make desired changes in a GIF frame. Some of these tools are Pencil, Brush, Eraser, Effect Brush, Pattern Brush, Spray Gun, Texture Mapper, Text Art, Custom Shape, Smudge, Snip, Razor, Opaquer, and more. It lets you import a new layer (blank or image file) to an individual GIF frame. You can merge layers, add border, customize blending mode, and do more. It also lets you export the edited layer as an individual file (JPEG, ICON, GIF, WEBP, PCX, PNG, etc.). From the Palette window, you can easily pick a color to use for editing. Standard editing tools like crop (simple/advanced), rotate, flip, resize, move, etc. can be used to further edit GIF frames. It provides an Effects menu which lets you add effects like emboss, oilify, etc., add noise like wavelet noise, median noise, etc., blur frames of a GIF, add color effects like posterize, duo tone, negative, etc., sharpen GIF frames, and do more. You can also change speed of GIF using this GIF frame editor. To know more about this, check here > GIF Speed Changer. Also, you can delete frames, change position of frames, insert new frames, etc. After editing a GIF frame, save changes and exit the editing window. You can also save edited GIF frames as individual image files. All in all, it is one of my favorite GIF frame editor for Windows. Chasys Draw IES can also be used to create an animated GIF. For that, you need to add a new Frame Animation or Object Animation project. Chasys Draw IES is basically a set of image processing tools. You can convert images formats, create icons, make animated or static cursors, create animations, process RAW files, capture a video, reduce photo noise, etc. RealWorld Paint is a free software to edit GIF frames. It is extremely easy to modify and add effects to individual frames of a GIF using this software. As you open the desired GIF, you will see all its frames at the bottom of the interface. From there, you can choose frames one by one and edit them individually. For editing GIF frames, you get basic as well as some advanced image manipulating tools. You can adjust color level, change transparency, rotate, resize, add effects (drop shadow, bevel, glow, etc. ), add a border, insert a watermark, and do more. It also provides tools to annotate individual frames of GIF, like adding text to them, using drawing tools, etc. You can delete frames from a GIF, insert a duplicate frame, insert a new frame using an image (using Layer menu), change frame rate, change animation speed, customize loop counts, etc. It also provides a Create filmstrip feature which lets you create an image with all frames of the GIF. The good part of this GIF frame editor is that it provides the real-time preview of the edited GIF in the right pane of its interface. So, you can edit GIF frames with accuracy. After that, you can save the edited GIF. RealWorld Paint is one the best GIF frame editor for Windows. The simplistic approach to edit GIF frames is the most desirable feature of this software. As it is basically a photo editor, you can edit images in PNG, JPG, BMP, WebP, etc. supported formats. GIMP is another alternative as a GIF frame editor. It is basically a cross-platform image processor for Linux, OS X, Windows, etc. platforms. It supports quite a good number of formats to edit, including JPG, PNG, BMP, TIFF, SVG, ICO, WMF, PDF, and more. It can be used to create animated GIF too. You can also edit existing GIFs as well as edit individual frames of a GIF. From Layers dialog window (Windows menu > Dockable Dialogs > Layers), you can see each frame of the added GIF. Select a frame to modify it. Now to edit GIF frames, you can use its standard tools like selection tools (rectangle select, free, select, etc. ), paint tools (pencil, blend, paintbrush, eraser, etc. ), transform tools (move, align, rotate, resize, etc. ), color tools (color balance, hue saturation, colorize, curves, etc. ), text tool, and more. By double-clicking on a frame, you can also change its properties like frame title, frame duration (in ms), etc. Also, you can delete a frame, create duplicate frames, change frame order, etc. You can also edit a GIF by adding different effects to it, like Blend, Burn-in, Rippling, Wave, etc. This can be done by going to Filters > Animation menu. From the same menu, you can optimize GIF, see the preview of the edited GIF, etc. Go to File > Export As option to save the edited GIF. Do remember to enable Animation checkbox while saving the GIF. You can even save edited frames as individual images (JPG, PNG, BMP, etc.) using same option. GIMP is an open source GIF frame editor for Windows. It can be used for multiple purposes, such as creating Kaleidoscope, WebP image editing, batch photo editing, converting WebP to GIF, etc.